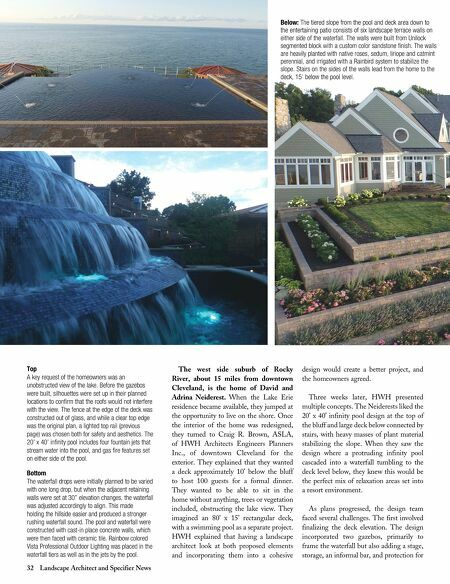 32 Landscape Architect and Specifier News The west side suburb of Rocky River, about 15 miles from downtown Cleveland, is the home of David and Adrina Neiderest. When the Lake Erie residence became available, they jumped at the opportunity to live on the shore. Once the interior of the home was redesigned, they turned to Craig R. Brown, ASLA, of HWH Architects Engineers Planners Inc., of downtown Cleveland for the exterior. They explained that they wanted a deck approximately 10' below the bluff to host 100 guests for a formal dinner. They wanted to be able to sit in the home without anything, trees or vegetation included, obstructing the lake view. They imagined an 80' x 15' rectangular deck, with a swimming pool as a separate project. HWH explained that having a landscape architect look at both proposed elements and incorporating them into a cohesive design would create a better project, and the homeowners agreed. Three weeks later, HWH presented multiple concepts. The Neiderests liked the 20' x 40' infinity pool design at the top of the bluff and large deck below connected by stairs, with heavy masses of plant material stabilizing the slope. When they saw the design where a protruding infinity pool cascaded into a waterfall tumbling to the deck level below, they knew this would be the perfect mix of relaxation areas set into a resort environment. As plans progressed, the design team faced several challenges. The first involved finalizing the deck elevation. 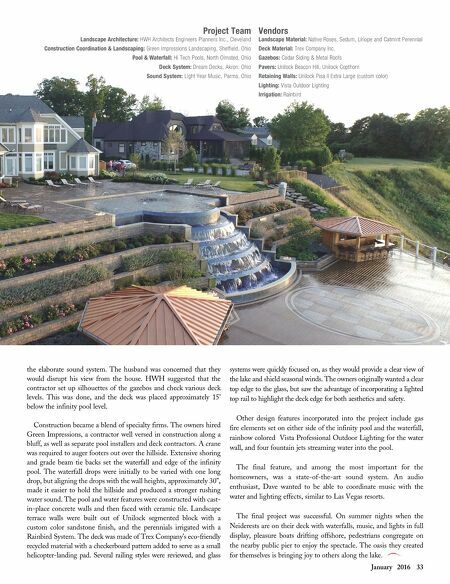 The design incorporated two gazebos, primarily to frame the waterfall but also adding a stage, storage, an informal bar, and protection for Top A key request of the homeowners was an unobstructed view of the lake. Before the gazebos were built, silhouettes were set up in their planned locations to confirm that the roofs would not interfere with the view. The fence at the edge of the deck was constructed out of glass, and while a clear top edge was the original plan, a lighted top rail (previous page) was chosen both for safety and aesthetics. The 20' x 40' infinity pool includes four fountain jets that stream water into the pool, and gas fire features set on either side of the pool. Bottom The waterfall drops were initially planned to be varied with one long drop, but when the adjacent retaining walls were set at 30" elevation changes, the waterfall was adjusted accordingly to align. This made holding the hillside easier and produced a stronger rushing waterfall sound. The pool and waterfall were constructed with cast-in place concrete walls, which were then faced with ceramic tile. Rainbow colored Vista Professional Outdoor Lighting was placed in the waterfall tiers as well as in the jets by the pool. Below: The tiered slope from the pool and deck area down to the entertaining patio consists of six landscape terrace walls on either side of the waterfall. The walls were built from Unilock segmented block with a custom color sandstone finish. The walls are heavily planted with native roses, sedum, liriope and catmint perennial, and irrigated with a Rainbird system to stabilize the slope. Stairs on the sides of the walls lead from the home to the deck, 15' below the pool level.